Now that I have graduated from Creative Chemistry 101, it's time to move on and use those skills I learned in class. Tim Holtz is back to his 12 Tags of 2012 and just completed his April tag. You can check it out here. Tim uses his new Bird Branch Alterations Die, but I didn't have that one (yet) so I used the tried and true bird from the Caged Bird die instead. I had just recently purchased a few of Tim's newest products: Springtime Background & Borders Texture Fades, Tattered Flower Garden Sizzix Strip Die and the Word Bands, so I couldn't wait to use them! I used Core-dinations Kraft Kore card stock for the main tag which is perfect for embossing. I am so in love with the Tattered Flower Garland die. You can cut so many flowers in one pass and they nest and stack and look so pretty. I cut my flowers from the floral paper in the Lost & Found paper pack. The new Word Bands are perfect for tags and cards, and of course scrapbook layouts. They all say something different and inspiring. 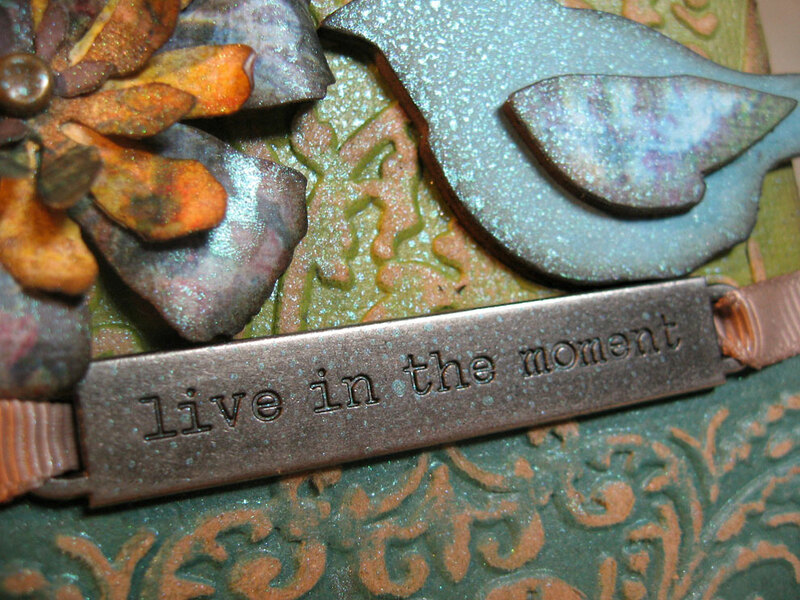 You can probably see that I gave my completed tag a shot of Perfect Pearls Patina spray. I think this might be my favorite mist. This tag was a gift for my blog winner last week Melinda who guessed my Starbucks coffee acronym. I hope she's received this by now. 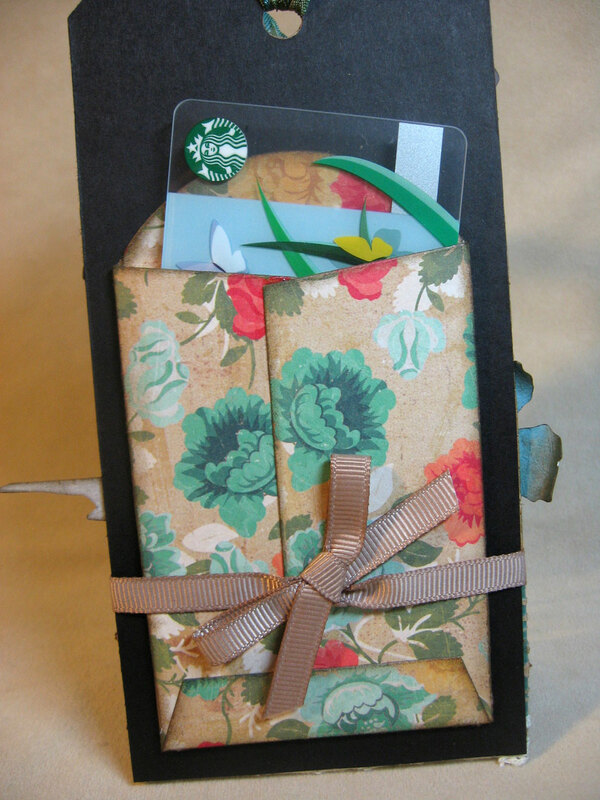 The little envelope on the back is a seed packet die from PaperTreyInk and it holds a gift card perfectly! And speaking of winners, I never heard back from my other winner last week who was randomly chosen to win a mystery prize box which is packed with all kinds of goodies and still sitting here. So I'm going to try to give it away again. If you've been a good blog follower and read all the way to the end of this post, simply leave a comment today and I'll draw another name to be announced here on Friday. Thanks for stopping in and checking me out. Have a fabulous day! Lovely tag and the colors. The flowers are so beautiful! Beautiful colors! Such a sweet bird and your flowers are fabulous! 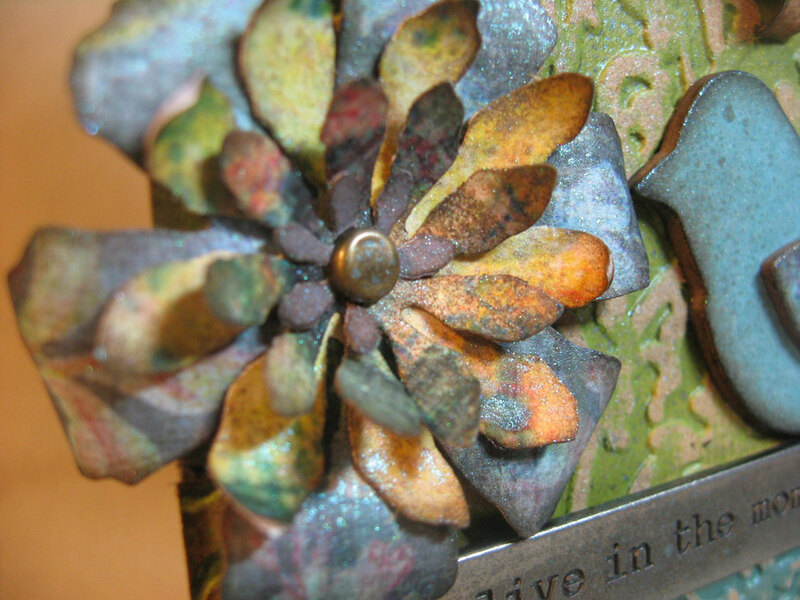 Beautiful tag and colors, Annette -- I love the mist! Especially love the little pocket on the back for a gift card. Great idea! Love your tag and the flowers are absolutely gorgeous. My Tattered flower garland die is on back order, can't wait. Annette, Thanks for sharing your inspiring artwork! A beautiful tag. I also love the way you organized your CC 101 notebook. I bought a notebook and now I'm inspired to set it up! Thanks so much! Great tag! I love how the gift card is tucked in on the back! Thanks for a second chance at some goodies! Such gorgeous colors on the flowers and I love how you misted the word tag. So subtle but very effective. I love the colors that you used. I is a beautiful tag. I also like how you did your notebook. I have started one like it. Hi Annette. I love you take on Tim's April tag. Lovely colours and flowers - that die is definitely on my list!! I am the LUCKY recipient of this tag and I will say that the pictures do not show its true beauty. Annette, you out did yourself. When I opened the envelope yesterday, seeing the tag took my breath away. And there is a Starbucks card, too! Woo hoo! Thank you, Annette. You made my week. I hope you don't mind that I plan to use the tag as a model for grift card holders in the future. What a gorgeous take on Tim's tag! Your tag is absolutely gorgeous!!! Tim had better watch out! I love your selection of colors. Beautiful tag! I just finished Tim's class, too. It was awesome. 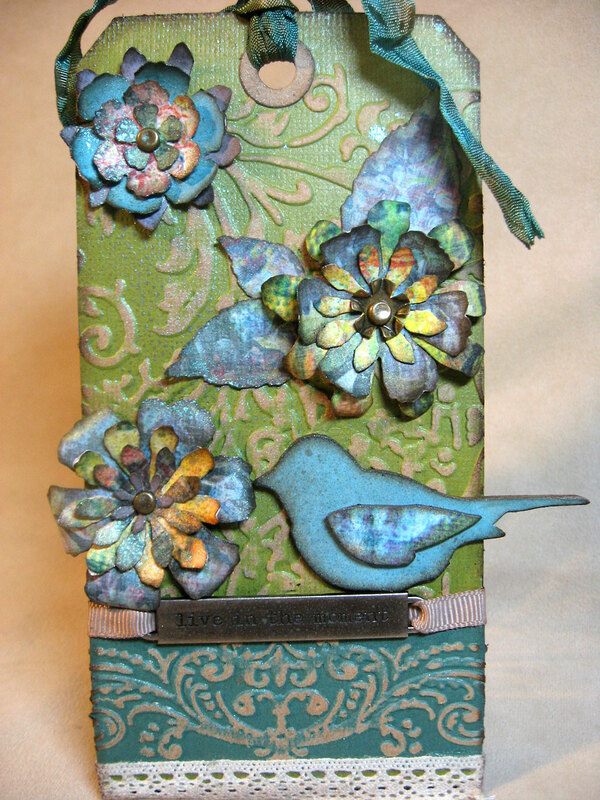 Ordered the Tattered Flower Garden die just this morning, and it has already shipped. Yippee! Lovely tag, thanks for sharing!